Our specialty here at Coastal Sands Realty is of course Myrtle Beach Real Estate sales, however, through our helpful links below, you will find a wide variety of Myrtle Beach and other area information. Whether you're looking to purchase your first home here in the Myrtle Beach area, or your perfect Myrtle Beach long term rental we're here to help. If there is something you can't find between our listings below on this page and our area info center, please let us know! Remember, we're here to help with all of your Myrtle Beach SC Real Estate needs. Our helpful team of Myrtle Beach Realtors will help you find your perfect Myrtle Beach Home or Condo for one weekend a year, or for years to come! Locate thousands of vacation rentals by owner. Condos, villas, cabins and more are available directly from the owner at VLBO.com. Golf Package Vacations in destinations all across the U.S. for every budget. Call toll-free 866-688-9938. 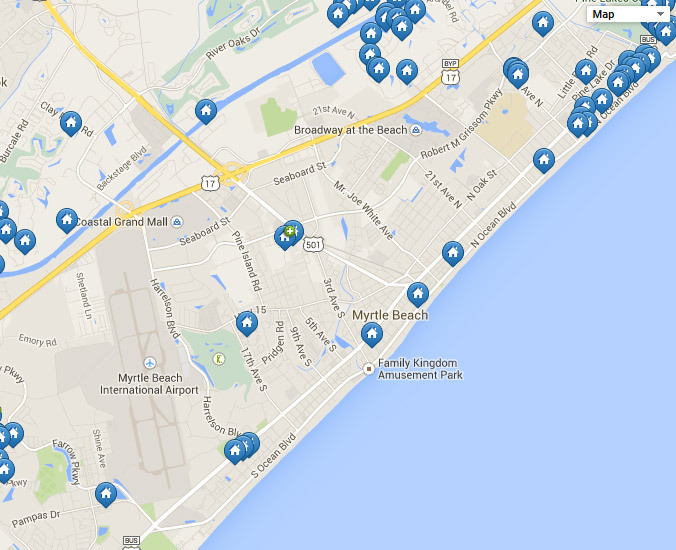 Over 275 Vacation Rentals in Myrtle Beach. GreatRentals.com advertises 275 privately owned vacation homes from all over the world. Book direct with the owners for great value! There is no better cost effective way to showcase your vacation home, condominium, cabin, chalet, beach bungalow or estate for rent or sale. LuxuryHomesNetwork.com is a company promoting luxury homes from all over the world. Please visit our website and start your search for the finest homes available on the market today. Condo.com is the best way to buy, sell, and rent a condo. As an advertising portal, and global multiple listings service, Condo.com is the world's largest condo marketplace. No commissions, lead fees, or closing fees. MyDreamLocale.com finds the best places to live. Provides real estate, school, demographic statistics. Cost of living comparisons for relocation. 100s of Goa Properties for Sale - with photos, floor plans and complete information. Try this Search before you think of Buying or Renting property in Goa. Search the entire Scottsdale metro area including Scottsdale, Fountain Hills, Paradise Valley, Cave Creek, Carefree, and more. Check out our new map based search system. Search your dream homes for sale and search mls real estate listings with the top realtor team in Tucson, Arizona. Arrowhead Ranch in Glendale Arizona is one of the Phoenix area's premier master planned community. This site provides information on schools, golf, entertainment and real estate in Arrowhead Ranch. Real Estate for the San Jose Saratoga Los Gatos and Monte Sereno areas. Real Estate for San Jose, California and surrounding San Jose areas. San Jose mls, fsbo, San Jose Probate Specialist, Relocation, Mortgage Calculators and more! Saratoga mls, Saratoga Probate Specialist, Relocation, Mortgage Calculators and more! Looking to buy San Diego real estate? Find all the available San Diego homes for sale by searching the MLS just like a realtor! Addresses and maps are available! Properties, your resource for real estate in Arcadia, San Gabriel Valley, and surrounding areas in Southern California. Buy smarter with more information. Up to the minute info including recent sales stats on Miami’s hottest condos with photos, virtual tours & floor plans. Buy Rent Free Provides free renter and home buyer services in South Florida, including free MLS services. Our 9 offices assist landlords and sellers in Dade, Broward and Palm Beach Counties. Search Las Vegas real estate, Las Vegas Homes, Las Vegas Condos, Las Vegas High Rises, new homes and resale homes from the your Las Vegas Real Estate Agents, The Roy and Shirley White Team. We have over 28 years experience helping Las Vegas, Summerlin, Henderson, North Las Vegas and Green Valley with all their Real Estate needs! The Las Vegas Real Estate Whittaker team is highly knowledgeable and experienced in the entire Las Vegas Valley Real Estate market for Listing and Relocating in greater Las Vegas and Henderson in Clark County, Nevada. Personal Service, Professional Results. Contact Dana Anderson-Whittaker at (702)300-SOLD (7653) or Dana@DanaAnderson.com. Waterfront and off waterfront homes and lots. Entry level to luxury. Serving greater Charlotte NC area since 1991. We have a long list of satisfied clients. Let us add you to that list. Your one-stop source for real estate services covering the Charlotte, Weddington, and Matthews areas. With a focus on exceptional service, you'll find everything you'll need from complete MLS listings, valuable home value calculation tools, and comprehensive area information! Use our map based search system to target properties and neighborhoods throughout the Portland OR Metro area including Beaverton, Lake Oswego, Gresham, Hillsboro, Milwaukie, Sherwood, Tigard and Tualatin. Information about the real estate market in Portland Oregon including schools, neighborhoods and maps. Let relocation specialist Salvador Del Cid help you find your dream home in Portland Oregon today! Your one-stop source for real estate services covering Charleston and Mt. Pleasant Homes for sale No Registration required. With a focus on exceptional service, you'll find everything you'll need from complete MLS listings, valuable home value calculation tools, and comprehensive area information! Your one-stop source for real estate services covering the Columbia, Irmo, and Lexington areas. With a focus on exceptional service, you'll find everything you'll need from complete MLS listings, valuable home value calculation tools, and comprehensive area information! Your one-stop source for real estate services covering the Charleston SC, West Ashley, and Mt. Pleasant areas. With a focus on exceptional service, you'll find everything you'll need from complete MLS listings, valuable home value calculation tools, and comprehensive area information! A Team of Dedicated Specialists Striving to Make the Home Buying Experience Flawless. Our Team Specializes in Roanoke, Botetourt, Salem, Bedford, Smith Mountain Lake, Blacksburg, Christiansburg Area. Seattle's Homes is your complete online guide to buying or selling Seattle real estate. Your one-stop source for real estate services covering the Rochester, Olympia, and Tumwater areas. With a focus on exceptional service, you'll find everything you'll need from complete MLS listings, valuable home value calculation tools, and comprehensive area information! Find your dream beach or golf home in one of America's premiere second home markets. When looking for property in the Myrtle Beach area, who else but Myrtle Beach Real Estate? Visit my website to search the MLS for all available properties in Myrtle Beach, South Carolina. I specialize in luxury homes, vacant land, waterfront property, and more. Your one-stop source for real estate services covering the Myrtle Beach, Murrells Inlet, and Pawleys Island areas. With a focus on exceptional service, you'll find everything you'll need from complete MLS listings, valuable home value calculation tools, and comprehensive area information!